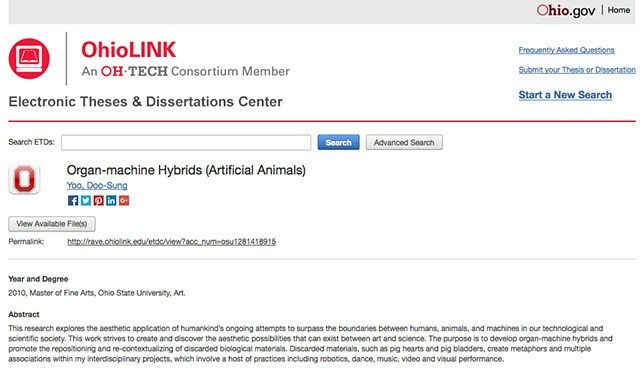 This research explores the aesthetic application of humankind’s ongoing attempts to surpass the boundaries between humans, animals, and machines in our technological and scientific society. This work strives to create and discover the aesthetic possibilities that can exist between art and science. The purpose is to develop organ-machine hybrids and promote the repositioning and re-contextualizing of discarded biological materials. Discarded materials, such as pig hearts and pig bladders, create metaphors and multiple associations within my interdisciplinary projects, which involve a host of practices including robotics, dance, music, video and visual performance. Master of Fine Arts, Ohio State University, Art.